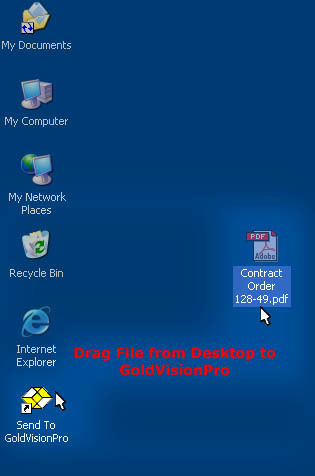 The strength of GoldVisionPro Software has always been the ability to create seamless, well constructed Document - Image - File Links in your system. We ensure that all files are available to the User’s that linked them, not just on their computer. 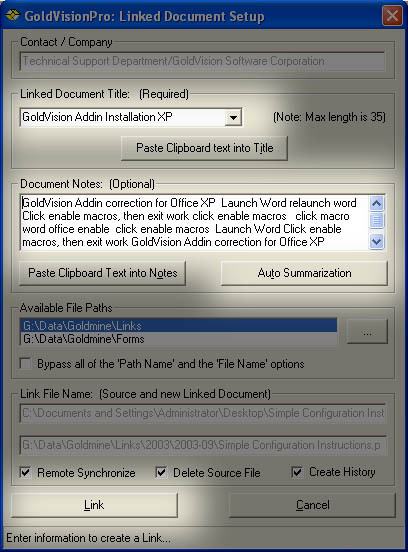 The GoldVisionPro Linker module has been renamed the V-QuickLink. It can be accessed from many places, including your Desktop, Sent To Menus, Right on the Link Center, and Directly from Microsoft Applications. The GoldVisionPro V-QuickLink offers powerful scanning solutions on both personal level and network level company wide scanning. Use Drag and Drop to take a file from your desktop, a network drive, or out of another application. Send it To GoldVisionPro to start the linking process. 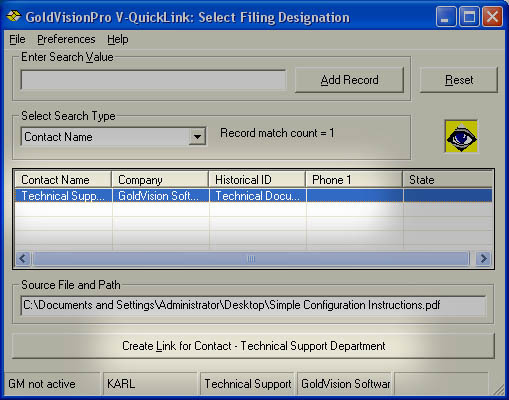 Once the V-QuickLink program is running, a User can Add a new Contact record. This is a very quick way to start an intelligent filing system with virtually no advance setup. 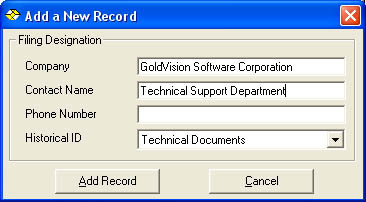 After setup of a new record, or by selecting from a search criteria, Users will select the Designated Record. Choosing this record will en effect "Open the File Folder" for the Contact that is desired. 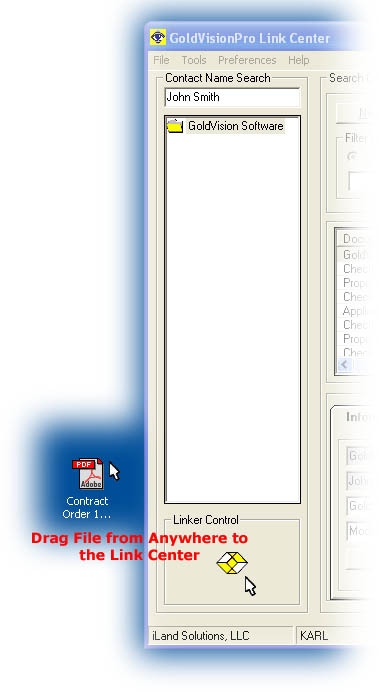 The Link Setup Screen is the place where a User can make "No Choices" and just hit LINK, or can select from a pre-defined list. Automatically, the Title is populated with the File Name. Users may over ride that with their own Title, but preferably, can use the drop down list that is provided. There are two forms of the drop down title list. One is a predefined list provided by a system administrator. The more common, is the ability to look at previous links in the same Contact, sorted, either ascending or descending. This is especially when performing links in a sequence, such as filing Bank Statements or Photos. A new link will be created with the same naming as other links for sort ability and standardization. However, a Title may be changed in the Link Center at any time in the future. There are some storage capabilities with the V-QuickLink setup screen. 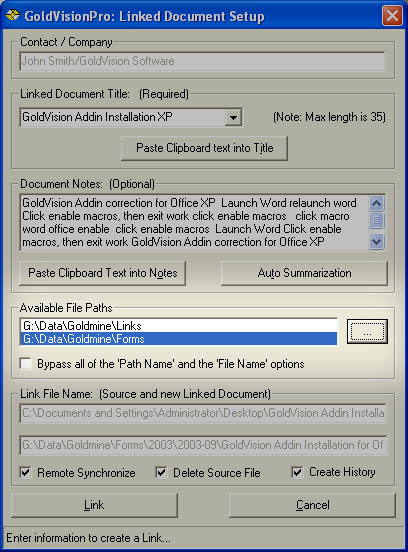 The initial document path is provided as a default location for the stored files. The second path is provided with the capability to "Browse" a network location. The browsing will start at the path as listed. This is especially useful for archiving different types of information, such as pictures, or for archiving.